We’d love your help. Let us know what’s wrong with this preview of Mistakes Were Made by Juliette E. Sebock. Mistakes Were Made is the debut poetry collection of Juliette Sebock. Written over years of watching the world around her, the poems compiled here examine love, loss, mistakes made, and lessons learned. This chapbook brings together poems about trauma, about love, and the moments in between. 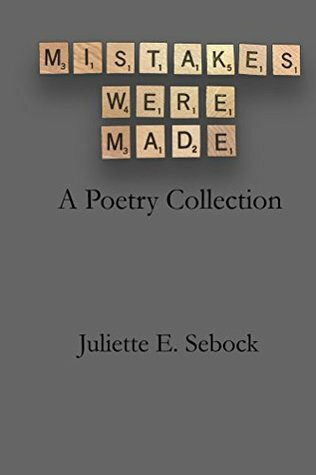 It takes a look at the mistakes we make throughout life, how we react to them, and Mistakes Were Made is the debut poetry collection of Juliette Sebock. Written over years of watching the world around her, the poems compiled here examine love, loss, mistakes made, and lessons learned. This chapbook brings together poems about trauma, about love, and the moments in between. It takes a look at the mistakes we make throughout life, how we react to them, and how they affect us going forward. If you've ever loved and lost, regretted your choices or held firm to your decisions, Mistakes Were Made is for you. To ask other readers questions about Mistakes Were Made, please sign up. Mistakes Were Made: A Poetry Collection by Juliette E. Sebock is a moving collection of works all brimming with emotion. I like emotional or dark stories and poems. To me, many of the poems conjured up feelings of loss or betrayal so the overall theme of the collection as I perceived it was right up my alley. There are 22 poems in this collection. Most of the poems are very short, so they were quick little morsels of the author’s heartcries (dare I say - short enough to memorize and take with Mistakes Were Made: A Poetry Collection by Juliette E. Sebock is a moving collection of works all brimming with emotion. I like emotional or dark stories and poems. To me, many of the poems conjured up feelings of loss or betrayal so the overall theme of the collection as I perceived it was right up my alley. There are 22 poems in this collection. Most of the poems are very short, so they were quick little morsels of the author’s heartcries (dare I say - short enough to memorize and take with you? :)). I found myself sometimes taking a break in my busy day to take in a few of these poems to give me something to ponder. I am a very literal person, so when I read poems I tend to try to visualize an exact situation, object, etc. that the author is trying to describe. It is hard for me to relax into poetry because I am so literal and want a specific picture painted for me, but Juliette’s poems expertly convey a feeling, an event or an object in a way that is both esoteric and relatable for me. She brought to life feelings and emotions that I and many other people have felt at one time or another. I think my favorite poem is Ghost. It is a haunting poem that can refer to ghosts of this world or ghosts of our memories. My second favorite poem is Lexicon - brief, sweet, and loving. Poetry of Silence was another one I liked. There were just a few poems that were beyond my grasp, like I couldn’t quite catch the meaning (which is fine because I think with any story or poem, the written word is a tool to articulate something that doesn’t need to be understood by the reader in a literal sense). These poems were Regent and Fracture(s)(d). Imagery of food and of animals, popping up in the spaces where words were difficult, were both interesting choices. 'Squirrel Song' and 'Trigger' were my favourites. Metaphors of princesses and knives verged on cliqué and lost some authenticity of voice and the throughline of the collection wasn't always clear. I enjoyed reading Sebock's collection and look forward to more work by her! Juliette Sebock is the author of Mistakes Were Made and has poetry forthcoming or appearing in a wide variety of publications, including Marias at Sampaguitas, Neologism, Peeking Cat Poetry, Kissing Dynamite, Mookychick, the Wellington Street Review, and more. She is the founding editor of Nightingale & Sparrow, and online literary magazine, and runs a lifestyle blog, For the Sake of Good Tast Juliette Sebock is the author of Mistakes Were Made and has poetry forthcoming or appearing in a wide variety of publications, including Marias at Sampaguitas, Neologism, Peeking Cat Poetry, Kissing Dynamite, Mookychick, the Wellington Street Review, and more. She is the founding editor of Nightingale & Sparrow, and online literary magazine, and runs a lifestyle blog, For the Sake of Good Taste. Currently, Juliette is working on an array of prose and poetry works.